Image: Horoscope of the April 29, 2018 Full Moon @9Sco38 which perfects at 8:58:06 pm edt Washington DC; Hour of Mars @22Cap59 which pre-figures the Great Conjunction of Saturn and Pluto on January 12, 2019 (22Cap46). Expansive Jupiter @19Sco29 Rx, which turns Direct @13Sco20 on July 10, 2018, rises with two malevolent stars: Serpentis, aka, Unukalhai (tragedy; misfortune) and North Scale (hasty words cause problems--Mr. Trump!--; tragedy; violence (A. Louis). If you believe the Oval Office tenure of Donald Trump is bringing America tragedy and misfortune, then we're on the same page. If not, we'll see, as Mr. Trump likes to say, for there is more 'swamp-drainage' he and his minions intend to do as the hollowing out of the federal government continues. It's pretty much skeletal now. Be that as it may or may not be, the April 2018 Full Moon in Scorpio is a snake-y sort of affair embedded with Scorpio issues of surveillance, betrayal, seeking control, lack of self-control, brooding, and with potentials for death and/or regeneration. Scorpio's Mars as chart-ruler makes no applying Ptolemaic aspects to other planets (emphasing his degree, sign, and house position) and neither does Pluto which conjoins Mars in the 2nd house of the National Treasury; the pair denotes potentials for brutal force; weaponry; violence; and people disabled in war (Ebertin)--the Veterans administration and its funding perhaps? However, Mars does apply to a sextile aspect with the Ascendant (22Sco18) (the fighting spirit) and thus, if we allow an angle, forms the base of a YOD-like pattern of crisis and/or a crossroad pointing toward to the Full Moon's corporate 8th cusp (in DC) where sits America's natal Mars and Trump's natal Sun, all @22Gemini. Mars-ASC = n Sun: a love of fighting and quarreling; focused will power. As you know, the willful Mr. 'Mars Rising' Trump often shows a natural tendency toward aggression, conflict, and stubborn will. Now as you see, this Full Moon is the engine leading a Locomotive pattern of ruthless determination toward success and forms a T-Square with the 9th house North Node denoting where new alliances and partnerships may be sought (foreign lands such as North Korea?). However, adaptation is necessary for best results and this picture is supported by the fact that the transit North Node in Leo will soon meet with America's natal North Node (a Nodal Return, every 18.6 years) which also indicates the forming of new alliances, bonds, and a potential for the breaking of weakened relationships (SN). Basically, in Politics and US society, we should expect further secrets, scandals, and facts to be revealed by the bright spotlight of the April 29, 2018 Full Moon with Scorpionic overtones--with similar uncovering, change of direction, and fulfillment energies as a disruptive 'wild card' Lunar Eclipse would have. This Full Moon degree of Scorpio perfects near Mr. Putin's natal Venus (11Scorpio) and in Mr. Trump's natal chart, the 9Sco38/9Tau38 axis falls within his 3/9 polarity of communications, foreign lands, and significant legal matters. 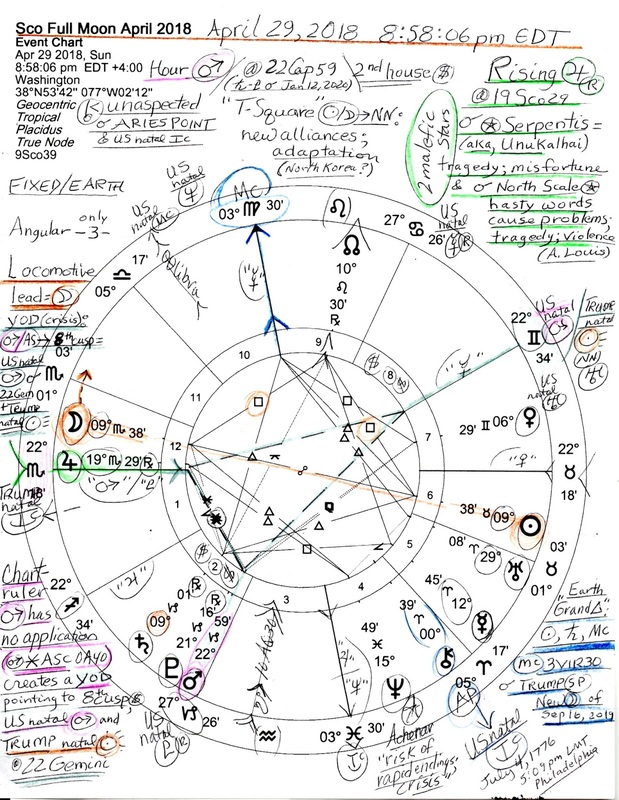 Apparently the Cohen and Mueller problems for Mr. Trump and his alleged relationships to Putin, Russia, money laundering, and sexual affairs (Scorpio) alunder the Collective microscope seemingly figure into the timing and planetary indicators of the April 2018 Full Moon. 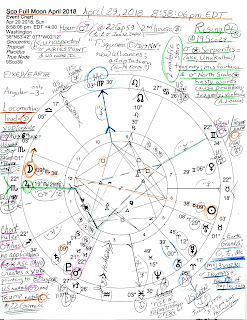 And curiously, the Full Moon's Midheaven (MC) @3Vir30 futuristically points toward the degree of the symbolic Progressed (SP) New Moon of Donald Trump (horoscope shown) which perfects on September 16, 2019..."A White Child Playing with Black Children" which in his case, may be only a shout-out to White Supremacists and Klan sentiments he favors and the SP New Moon's new cycle of activity for Trump who now operates in the dark of a Balsamic Moon phase and was nominated and inaugurated under its secretive influence of endings and partings. Paraphrasing Carelli: '9Scorpio': "A Child in a Tub"...a degree of childishness. An irregular development of mind and character in childhood, an inordinately developed ego, exaggerated reactions (form) a superiority complex; restless, hypercritical, irreverent and ingenuous. Does Carelli mean 'disingenuous' or perhaps 'ingenious'? Carelli: '10Scorpio': malice ranging from witty joke to coarse treacherousness; a lightening-like presence of mind and intuition; in stupid natives, cunning. In lower beings, a scheming brain, a soul that can exploit to the utmost the sympathy it awakens in others. The greatest faculty of dissembling and surprise, a marked political talent. In contemptible beings, double-dealing. In all cases the character will be close, silent, sphinx-like, and fond of secrecy. Additional info on Mr. Trump may be found in a previous post Carelli's Degrees: the Natal Mercury of Donald Trump. Warning: it's very descriptive! Quoting Dane Rudhyar: "'9Scorpio': "A Dentist at Work" (or an investigator? jc); Keynote: Overcoming the negative results of social practices and ego-cravings...INVENTIVENESS." (Noted is age 7 when everyone's permanent teeth appear, including Trump's.) He adds that, "...society and civilization, which may indirectly cause tooth decay, then have to invent means to skillfully repair the damage." '10Scorpio': "A Fellowship Supper Reunites Old Comrades" (Russian comrades? jc); "Keynote: The overtones of human relationships based on a community of work or experiences. COMRADESHIP. is emphasized." (He adds that this is a picture of, "a bond that unites individuals who have participated in some common activity." Well, allegedly so for Putin and Trump, plus, Cohen, Stormy Daniels and Donald Trump Trump. For as my favorite skunk Pepe Le Pew would say, it's so-o-o romantic!